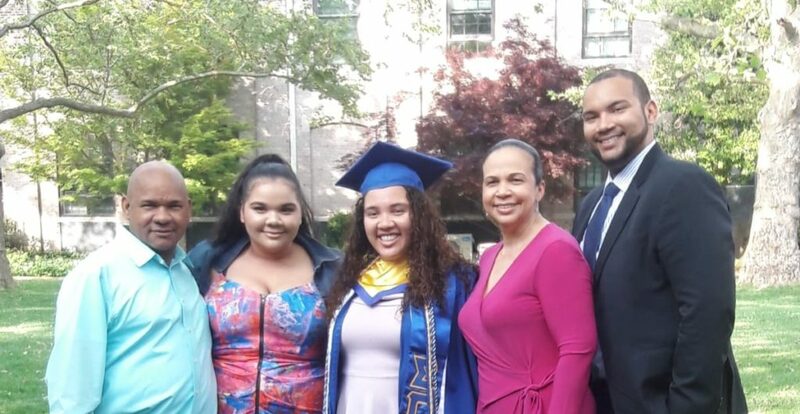 The Tejada family at Joandalys Tejada’s graduation from Hofstra University. Luz and Francisco Tejada moved to New York City from the Dominican Republic in the late eighties so their family would have a shot at the American Dream. Three decades later, their hard work and sacrifices are paying off, with all three of their children going to college and moving forward in their careers. Jason, Joandalys, and Jorvelyn Tejada each recognize that their CSF scholarships opened the doors to many other opportunities that have enriched their futures. Jason, a Columbia University graduate, started his career as an analyst at J.P. Morgan, and soon will begin a new position at Morgan Stanley. Joandalys recently graduated from Hofstra University as a premed major, and plans to begin medical school soon. The youngest, Jorvelyn, will graduate from Fordham University in 2020 with a communications degree. Luz first heard about CSF through Jason’s third grade teacher, who thought he would thrive in a private school setting. Luz applied for and won a scholarship, and she chose Incarnation School in Washington Heights for its disciplined and family-like environment. Once Jason became a CSF Scholar, Joandalys and Jorvelyn also became eligible, and all three siblings excelled academically at Incarnation, securing scholarships for high school. “The day you gave my brother that scholarship marked a huge change in our lives,” Jorvelyn shared. After graduating from Incarnation, the Tejada children have gone on to future successes in high school, college, and beyond, but they remain committed to helping those coming after them. Jason has served as an Incarnation board member and has spoken at CSF fundraising events. His sisters are both active volunteers in their community and have remained involved with CSF. Jorvelyn even traveled to Albany with CSF to testify to lawmakers about the value of her scholarship. This is all in keeping with their parents’ wishes for the siblings to aim high while remembering their values. Note: To read a year-end letter from Jason Tejada to CSF supporters, please click here.